Print board games, card games, bingo games, domino games, etc. 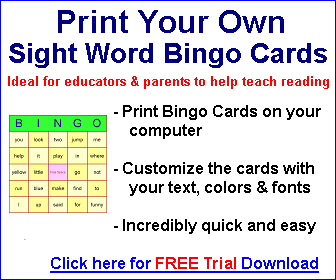 Ideal for teachers, parents, homeschoolers and tutors. Teach your child to read with Uncle Roger's multi-sensory phonics learning system - Guaranteed! Download this program immediately and begin teaching your child how to read with linguistic, multi-sensory and phonics methods - No matter what their skill level.